Bridlington Town’s inconsistent start to the season has left manager Gary Allanson warning that there are ‘big decisions’ ahead for the club. Town were beaten 3-1 by Nostell Miners Welfare at Queensgate on Saturday, jutst four days after beating fancied Handsworth Parramore. He said: “A very, very disappointing result on Saturday, but more disappointing was the performance especially after the way we played against Handsworth on Tuesday. “We had a discussion after the game, not shouting and screaming, but a frank discussion of what went wrong and why we are so inconsistent and how we can perform so differently in such a matter of days. 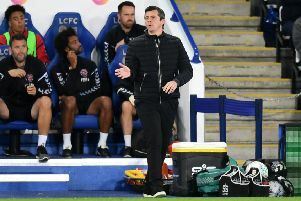 “The preparation wasn’t ideal because of them turning up late and having to kick off at 3:25pm and then the injury to their goalkeeper after six minutes, so everything was stop-start, but that is no excuse for that performance. “There was a lack of energy, passion, desire and quality, don’t take anything away from Nostell they worked far harder than us and showed far more desire and deserved the win. “I looked around the changing room after the game and the players were hurting. They know they had let themselves, each other and the club down but I don’t know why they performed so badly. “As the manager I will take full responsibility as I select the team, formation and tactics and I have to motivate and inspire the players. “Maybe I can’t do that now and the respect in the dressing has gone. I am still hurting enormously, but we can’t keep having a good performance, then a very poor performance, we need to hit some consistency. “We all need to go away and reflect where we are and where we want to get to as a club, team and individuals. We are all on thin ice at the moment, the chairman needs to look at what he wants and if he has the right people in place to get him there. “If not he needs to change it very quickly. As a manager I need to look at the players and do they fit the criteria what we want to be successful, we are not here to provide a game a football, we want to win and if I cannot motivate, influence them to achieve this then it’s time for me to make big decisions. “Either try and bring the right players in or move on and open the door for somebody else to come in. “After the Parkgate and Nostell performances where we got totally out-worked, out-battled, we need to seriously look at ourselves. “Hopefully we can turn this around, if not there could be a lot of changes at the club this time next week because we cannot continue being a mediocre side putting in mediocre performances. “We have kept the majority of players from last season but we look so different and that’s the disappointing aspect of all this, we have all shown loyalty but this doesn’t seem to be getting us anywhere. Bridlington take on title favourites Tadcaster Albion tonight.